Contrary to popular beliefs, large cities have worst problems with electricity than smaller cities. I had steady and dependable electricity in Les Cayes, Haiti. In Port-au-Prince, Haiti I have electricity about fifty percent of the time. Les Cayes, Haiti 95 percent of time. Theft is the problem in my opinion, small cities collect their electrical bills, while in large cities theft is out of control. Therefore, when the money runs out, the lights go off, or they may call is brownout or load shedding. What do I truly need? The fan is the problem, batteries are great for compuetrs, cell phones, etc. when electricity I have electricity 50 percent of the time. I remember in Ethiopia, the electricity was off most of the day, then from about 7:00 pm until 10:00 pm it came on. The bars opened, then closed when the lights went off, like the system was set up for the bar owners. Nepal has load sharing, they confused their English, they really have load shedding, it is organized. They have a lot of dams with electricity, but sell it to India. The electricity surges on, then drops, the electricity here in Haiti is low voltage, then too high. There are so many variables that cause this problem, but in the end, theft is the big one. Did you know the soldiers had air conditioned tents? Here is nugget of advice, do not book air conditioned rooms in countries like Haiti. AC sounds like a reasonable idea, but an air conditioned room, with no electricity is a great way to overheat. They will turn on the generator, but it will not supply juice to the AC. 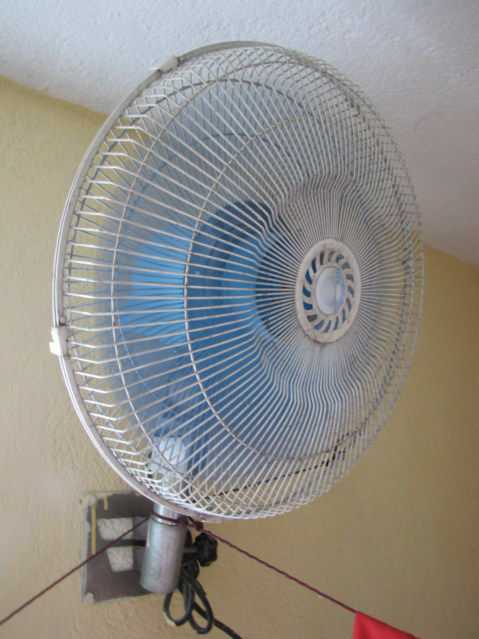 Because you are in an air conditioned room, you will not have a fan. Just when you thought you was clever, you are not.